I’m starting a new adventure! My new blog will be a heavier on the writing, but will still include a bunch of the wonderful things I get to cook along the way. Visit me over on Henpeck Lane, just click the picture! Happy Valentines Day! I hope you are spending the day celebrating with loved ones and eating just a little too much chocolate. This is a quick and spicy recipe to put some real food in your belly before you unwrap one more chocolate kiss. This recipe is from Food Network Magazine, June 2012. Heat the vegetable oil in a large skillet over med-high heat. Add the ground beef, half of the minced onion, 1 tsp salt and the chipotle chile powder; cook, stirring and breaking up the meat with a wooden spoon, until the meat is browned and the onion is tender, about 7 minutes. 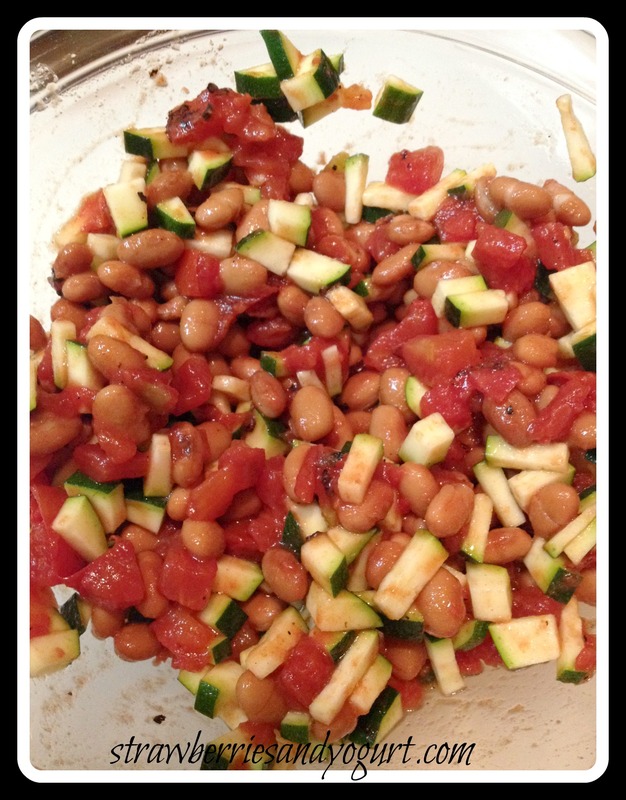 Add the tomatoes, beans and zucchini and cook, stirring occasionally, until the zucchini is just tender, about 6 minutes. Meanwhile, toss the coleslaw mix, lime juice, salt and pepper to taste in a bowl. 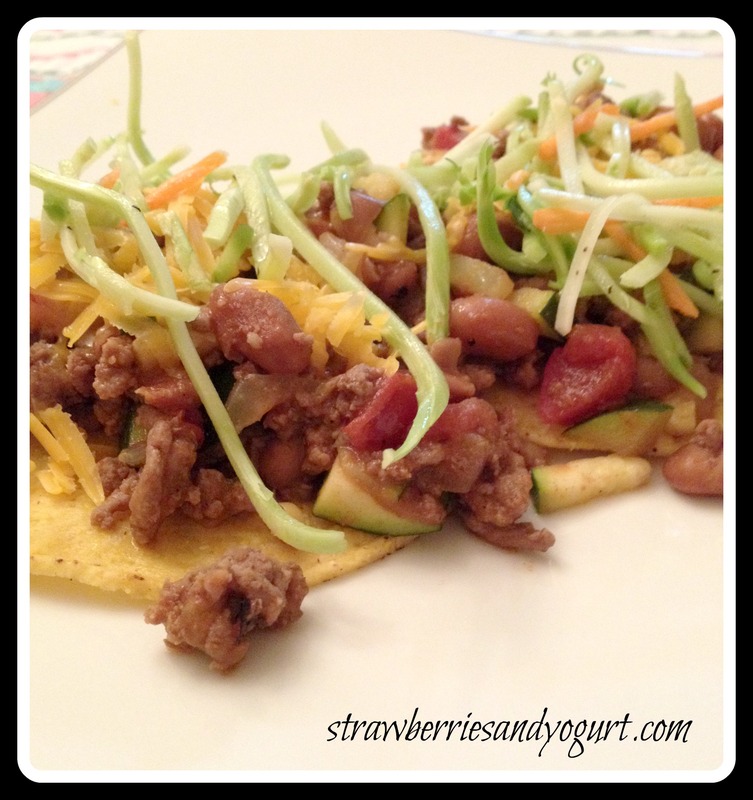 Divide the tostadas among plates and spoon the beef mixture on top. Top with cheese, slaw and remaining minced onion. Serve with lime wedges. I used a heaping tsp of the chipotle chile powder, and it was plenty spicy for us. It just depends on how spicy you’d like you’re mixture to be. 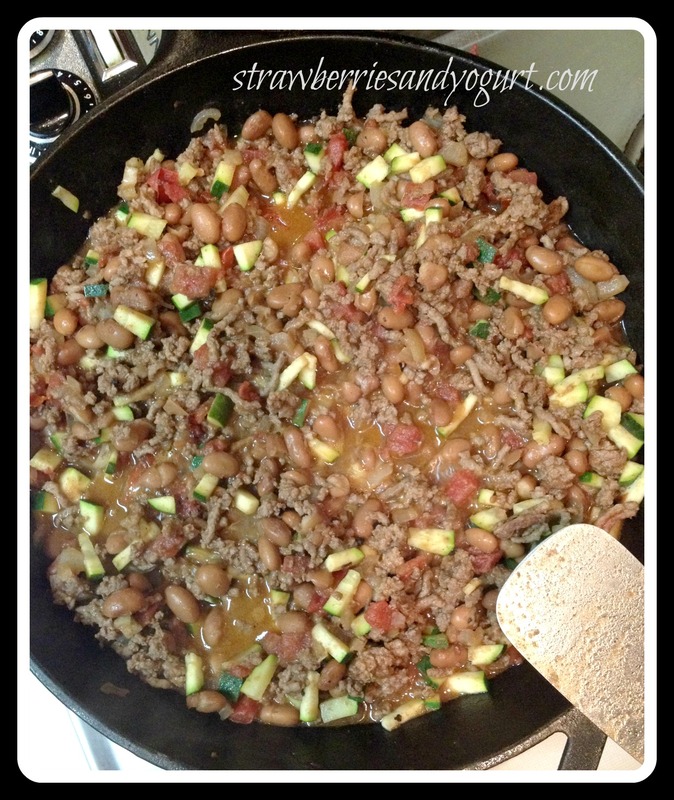 This is great quick recipe for a weeknight meal. Sometimes I get to spoil my friends and make really fun desserts. Husband and I had a dessert date with another couple, and I wanted to try something different and fun, who knew In Style mag would be the one to deliver the right recipe? This recipe is from In Style, November 2011. Cream butter, sugar and vanilla. Blend in flour to form a ball. Press dough onto bottom and about 2 inches up the sides of a 9-inch spingform pan. Spread with a thin latyer of raspberry jam. Refrigerate crust while preparing filling. 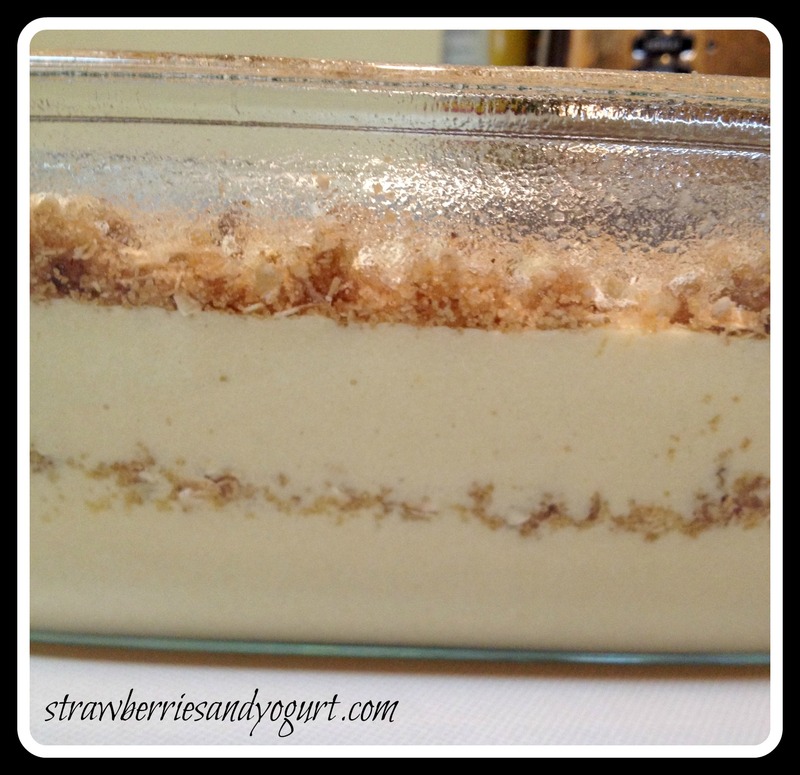 Combine cream cheese and sugar. Add eggs and vanilla; mix well. 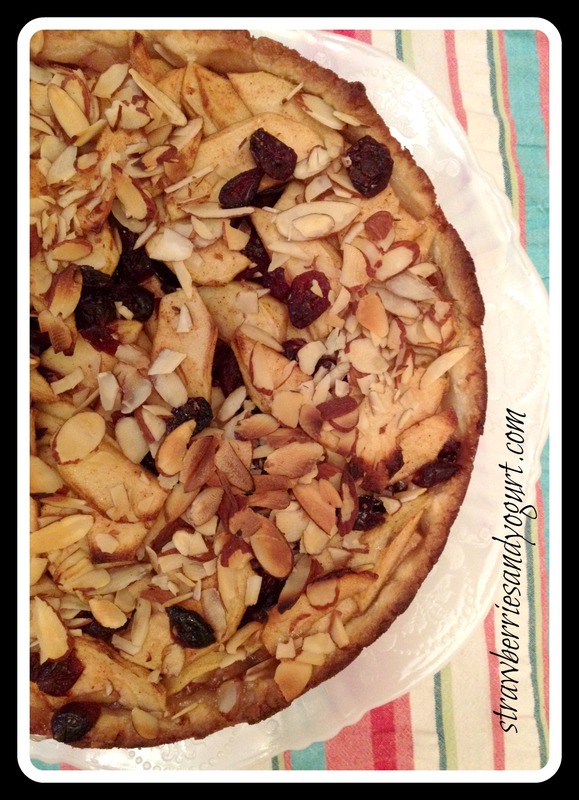 Toss apples and cranberries with sugar and cinnamon; spoon over cream cheese later and sprinkle with almonds. Bake torte at 450 for 10 minutes; with torte still in the oven, lower heat to 400 degrees and bake for 40 additional minutes. Chill in the refrigerator for at least 1 hour to firm up filling. Use a thin knife to carefully loosen torte from sides of pan and remove. Transfer to a serving plat and enjoy! I can not wait to make this again. I’m thinking of changing the apple mixture to fresh berries with pecans. I didn’t press out the crust enough in the crease, so it was a bit hard to cut through, but, OH THE CRUST! It’s a giant shortbread cookie. Then layer on the raspberry jam, the cream cheese filling and the tart apples? HEAVEN. Do yourself a favor and make this ASAP. Maybe even for your sweetie on Valentines! Do you guys always have dried cranberries on hand? I do. I put them into my chicken salad; toss them in for a little sweetness in a green salad; or sometimes just a sweet afternoon snack. This recipe is from Cooking Light, November 2008. 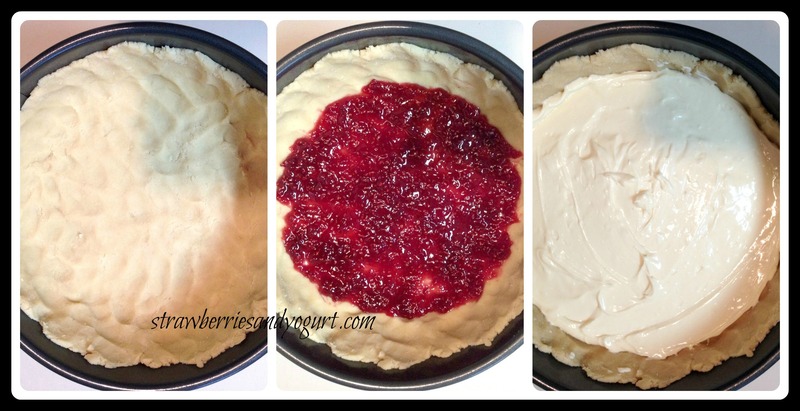 To prepare crust, weigh or lightly spoon flour into a dry measuring cup; level with a knife. Combine flour and next 5 ingredients (through cinnamon) in a medium bowl, stirring well with a whisk. Drizzle butter and juice over flour mixture, stirring until moistened (mixture will be crumbly). Reserve 1/2 c oat mixture. 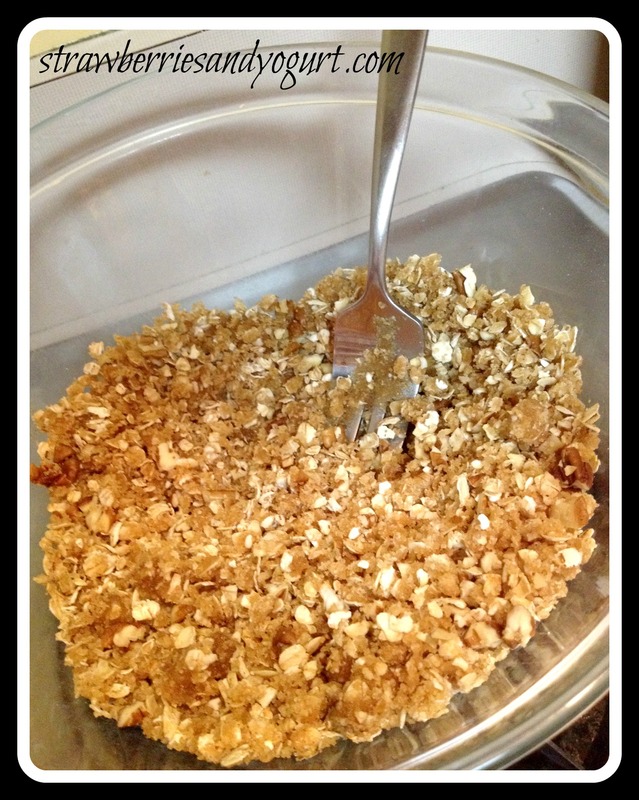 Press remaining oat mixture into the bottom of an 11×7-inch baking dish coated with cooking spray. 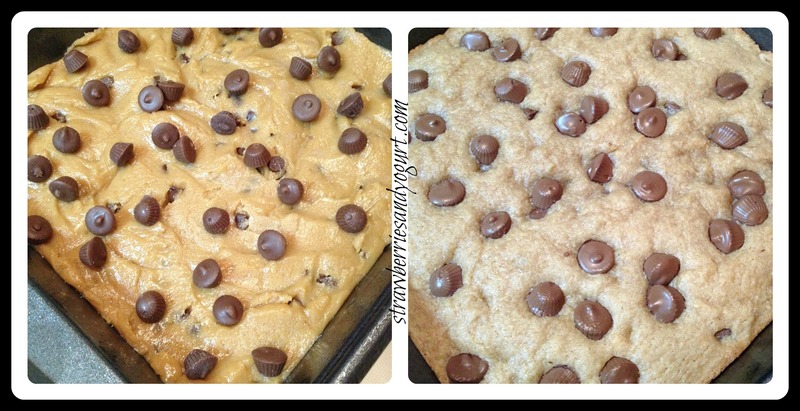 – I used a 9 inch square baking dish. To prepare filling, combine ingredients in a medium bowl, stirring well. 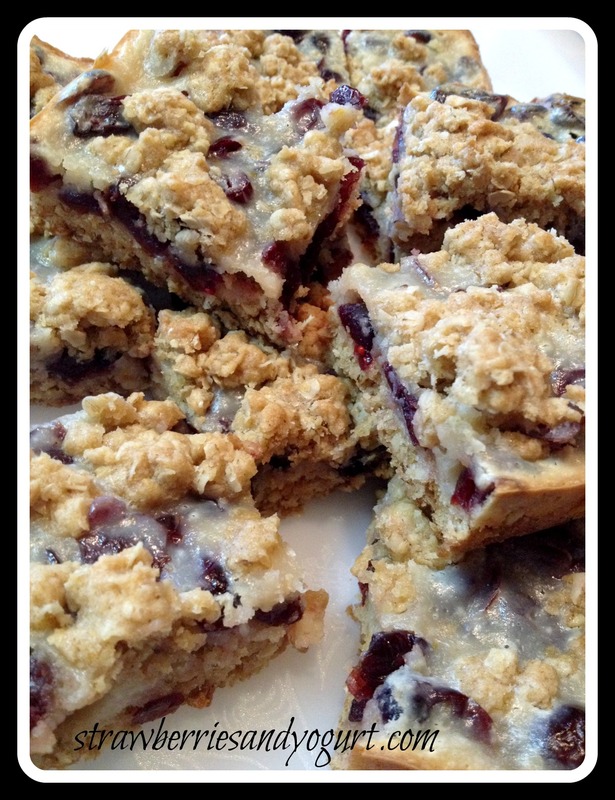 Spread cranberry mixture over prepared crust; sprinkle reserved oat mixture evenly over filling. Bake at 325 for 40 minutes or until edges are golden. Cool completely in pan on a wire rack. I’m not a fan of sour cream, so I wasn’t so sure how this one would turn out. BUT I’m trying to not be prejudiced towards ingredients, so I decided to give it a go. SO GOOD, and completely unexpected. We enjoyed these with friends and coffee in front of the fire on a chilly winter night. Do you guys get as excited as I do to try new recipes? I can read a cookbook like a novel, drinking in details, picturing how the flavors will meld together and hoping when I make the dish it’ll be better than I imagined. Each week I shift through cookbooks, and notebooks full of recipes waiting for something to jump out at me and say “This is the week! It’s my turn!”. These tacos shouted loud and did not disappoint. This recipe is from Cooking Light, October 2012. Place chicken in a large zip-top plastic bag. Add 1 tblsp soy sauce to bag; seal. Marinate at room temperature for 30 minutes. Remove chicken from bag; discard marinade. Place 1/4 c cornstarch in a shallow dish. Sprinkle the chicken evenly with salt. Add chicken to cornstarch in dish and toss chicken to thoroughly coat. Shake off excess cornstarch. Heat a large skillet over med-high heat. Add 1 tblsp canola oil to pan; swirl to coat. Add half of coated chicken; saute for 6 minutes or until done, turning to brown. Remove chicken from pan using a slotted spoon; drain on paper towels. Repeat the procedure with remaining oil and chicken. Combine remaining 1 1/2 tsp cornstarch, remaining 2 tblsp soy sauce, honey and next 3 ingredients (through sambal oelek) in a microwave-safe bowl, stirring with a whisk until smooth. Microwave at HIGH for 1 1/2 minutes or until slightly thick, stirring twice. Stir in garlic. Combine soy sauce mixture, chicken, peanuts, and celery; toss to coat chicken. Toast tortillas under broiler or on a griddle until lightly blistered, turning frequently. Place 2 tortillas on each of 4 plates; divide chicken mixture evenly among tortillas. 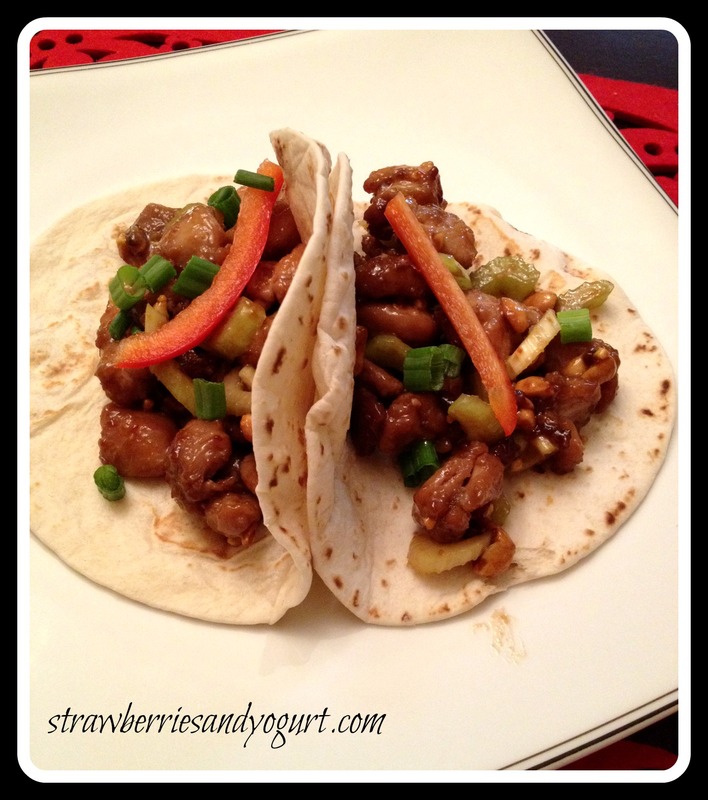 Top each taco with green onions and bell pepper strips; serve with lime wedges. A sweet friend and her husband just finished building their dream home. When going over to see the new diggs, I wanted to bake something special to celebrate. She and I sat, talking for hours, enjoying the gorgeous view and each having two generous pieces of this bread. Substitution made. 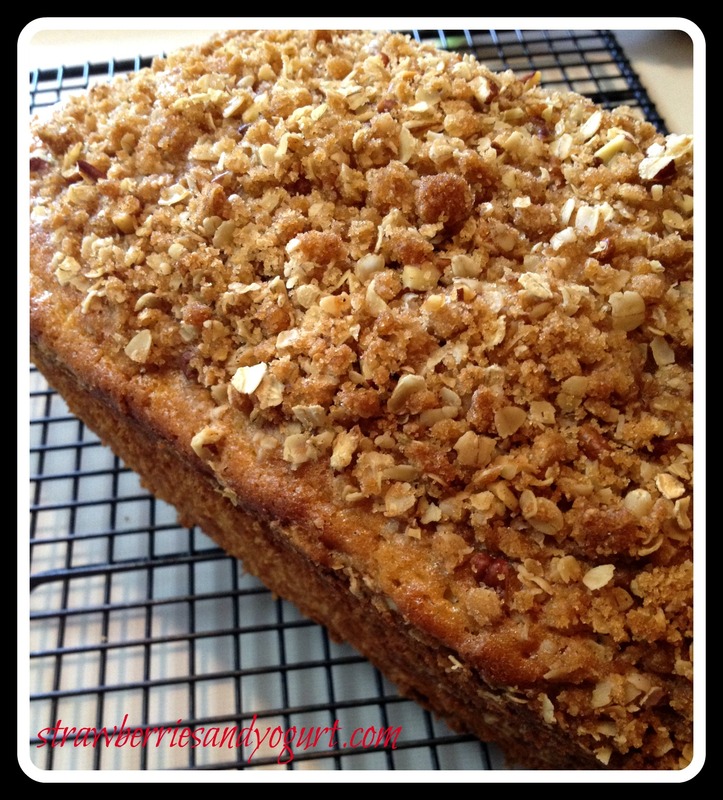 The original title for this recipe is Walnut Streusel Bread. I just don’t do walnuts, so pecans (the better nut) were substituted. To prepare streusel, combine first 5 ingredients in a medium bowl. Add 2 tblsp melted butter, stirring until well combined. Stir in nuts, set aside. To prepare bread, weigh or lightly spoon 9 oz flour in to dry measuring cups; level with a knife. Combine flour, baking soda, baking powder and 1/2 tsp salt in a bowl, stirring well with a whisk. Combine 5 tblsp butter and granulated sugar in a large bowl; beat with a mixer at med-high speed until well blended. Add eggs, 1 at a time, beating well after each addition; beat in vanilla. Beating at low speed, add flour mixture and buttermilk alternately to sugar mixture, beginning and ending with flour mixture; beat just until combined. Scrape half of batter into a 9×5-inch loaf pan coated with baking spray; sprinkle with half of streusel mixture. Spread remaining batter over streusel; swirl. Sprinkle remaining streusle on top of batter. Bake at 350 degrees for 50 minutes or until a wooden pick inserted in center come out with moist crumbs clinging. Cool 10 minutes in pan on a wire rack. Remove from pan; cook completely on wire rack. This quick bread is a buttery, crumbly coffee cake. Meant to be enjoyed with a hot cup of coffee and a dear friend. I wasn’t someone who lived off of Ramen in college, so I was excited to try out this recipe. The funny part was trying to figure out where the Ramen is kept in the supermarket. This recipe is from Real Simple, October 2012. Heat the oil in a Dutch oven over med-high heat. Season the pork with 1/4 tsp each salt and pepper and cook until cooked through, 2 to 3 minutes per side. Let rest for 5 minutes before thinly slicing. Add the scallion whites and ginger to the drippings in the Dutch oven. Cook, stirring, until softened, 1 to 2 minutes. Add the broth and bring to a boil. 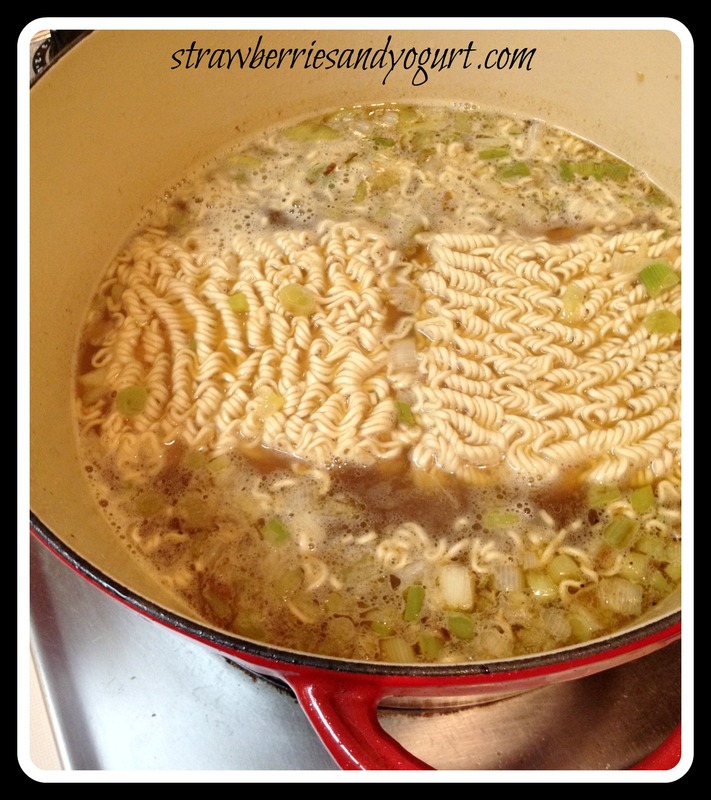 Add the noodles and boil, stirring occasionally, until tender, 2 to 3 minutes. Stir in the soy sauce. 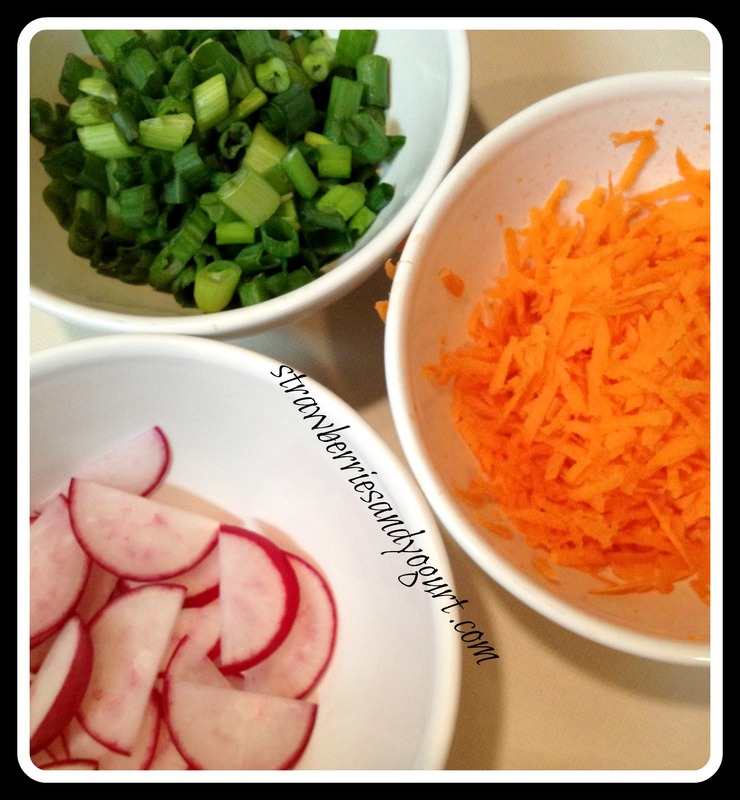 Serve the soup topped with the port, carrot, radishes, cilantro and scallion greens. Gosh this is some good soup, loved the ramen noodles. The ginger and scallions add a sweet and slightly pungent taste to the broth. 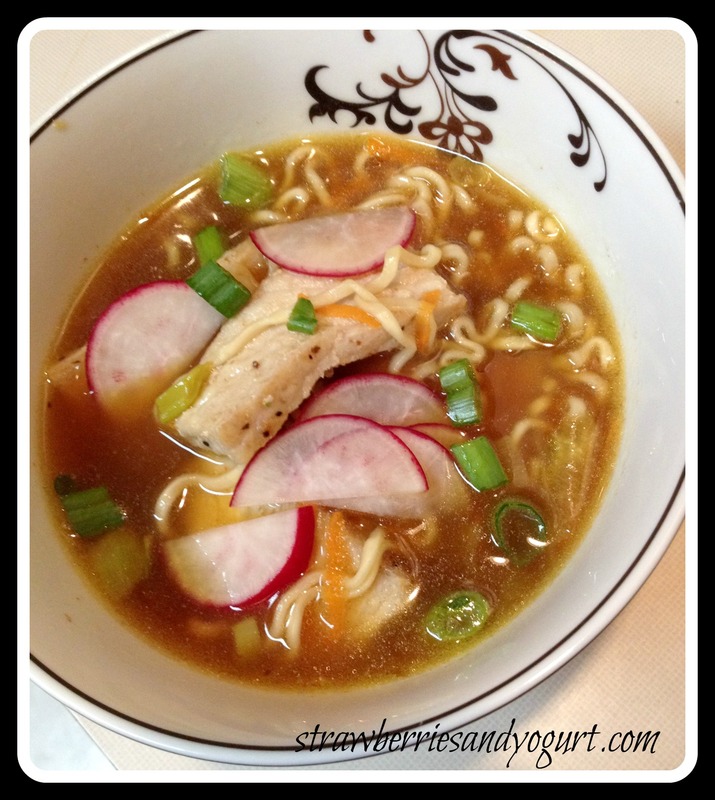 I added the pork and carrots into the soup before serving, and topped with the radishes and scallions. 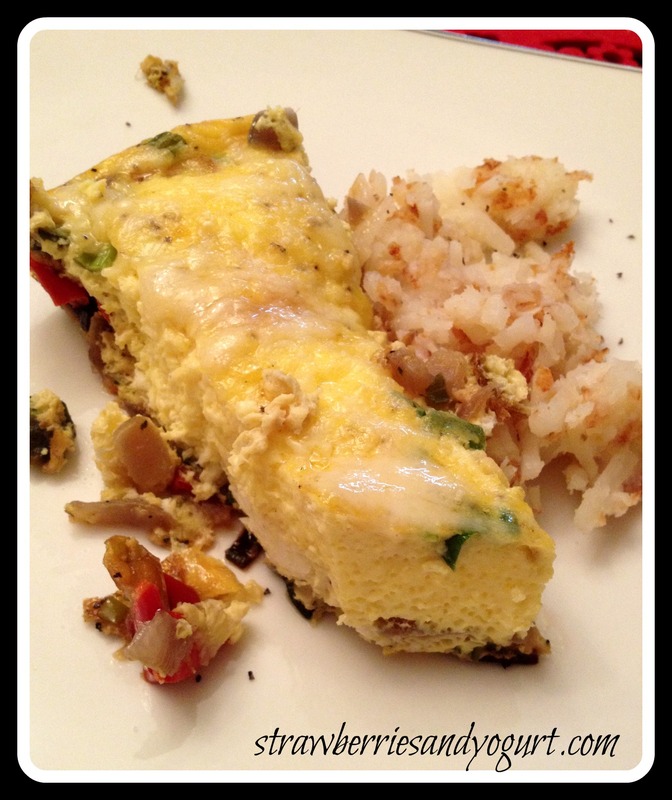 We love quiche in our house, but haven’t really tried a frittata before. I’m glad I finally decided to try. This recipe is from Food Network Magazine, September 2012. 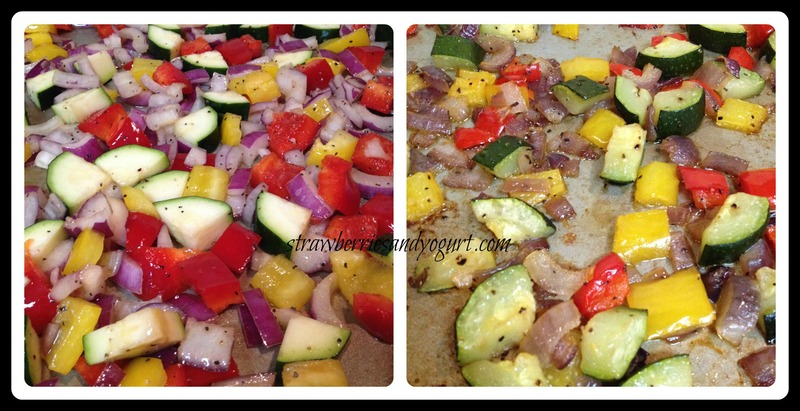 Place the zucchini, peppers and onion on a sheet pan. Drizzle with the olive oil, sprinkle with 1 1/2 tsp salt and 1/2 tsp pepper and toss well. Bake for 15 minutes. Add the garlic, toss again and bake for another 15 minutes. Remove from the oven and turn the oven to 350 degrees. Meanwhile, in a large bowl, whisk together the eggs, half-and-half, parmesan, 1 tsp salt and 1/2 tsp pepper. In a 10-inch ovenproof saute pan, melt the butter and saute the scallions over med-low heat for 1 minute. Add the roasted vegetables to the pan and toss with the scallions. Pour the egg mixture over the vegetables and cook for 2 minutes over med-low heat without stirring. Transfer the pan to the oven and bake the frittata for 2- to 30 minutes, until puffed and set in the middle. Sprinkle with the gruyere and bake for another 3 minutes, until the cheese is just melted. Cut into 6 or 8 wedges and serve hot. This puffed up and was beautiful. The changes I make next time? Less oil on the veggies. 1/4 c or less would be fine. Stir the veggies and the eggs when added to the pan. Since I didn’t do this, the veggies all stayed at the bottom like a vegetable crust; which isn’t bad, but it didn’t match the picture. 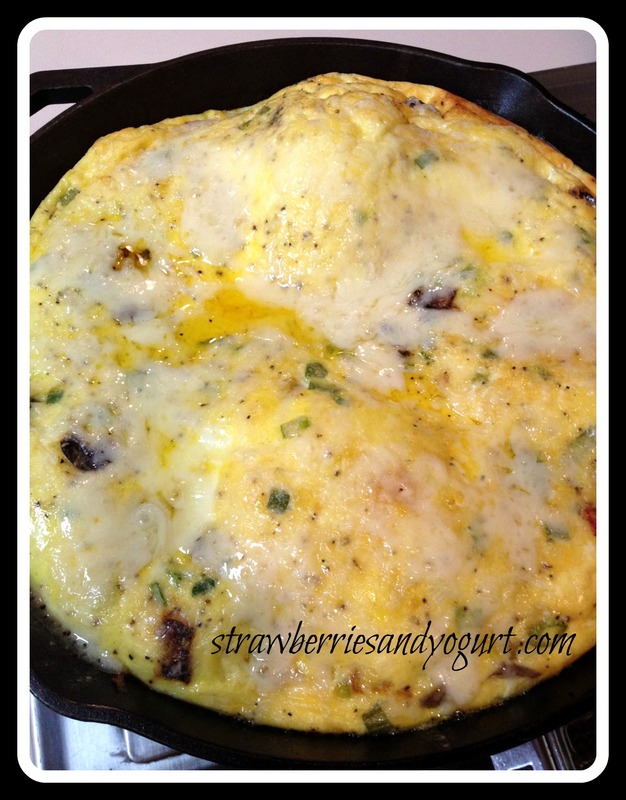 Another great recipe for a special Saturday breakfast! When the temps get down to single digits and you’re stuck in the house all day, it’s time to bake. This recipe is from Cooking Light, September 2011. Weigh or lightly spoon flour into dry measuring cups; level with a knife. Combine flour and next 3 ingredients (through salt), stirring well with a whisk. Combine peanut butter and next 4 ingredients (through eggs), stirring well. Add peanut butter mixture to flour mixture; stir until combined. Stir in chocolate chips. Scrape the batter into a 9-inch square metal baking pan lightly coated with cooking spray, and arrange the peanut butter cups over batter. Bake at 350 for 19 minutes or until a wooden pick inserted in center comes out with moist crumbs clinging. Cool in pan on a wire rack. Chocolate and Peanut Butter, what could be better? 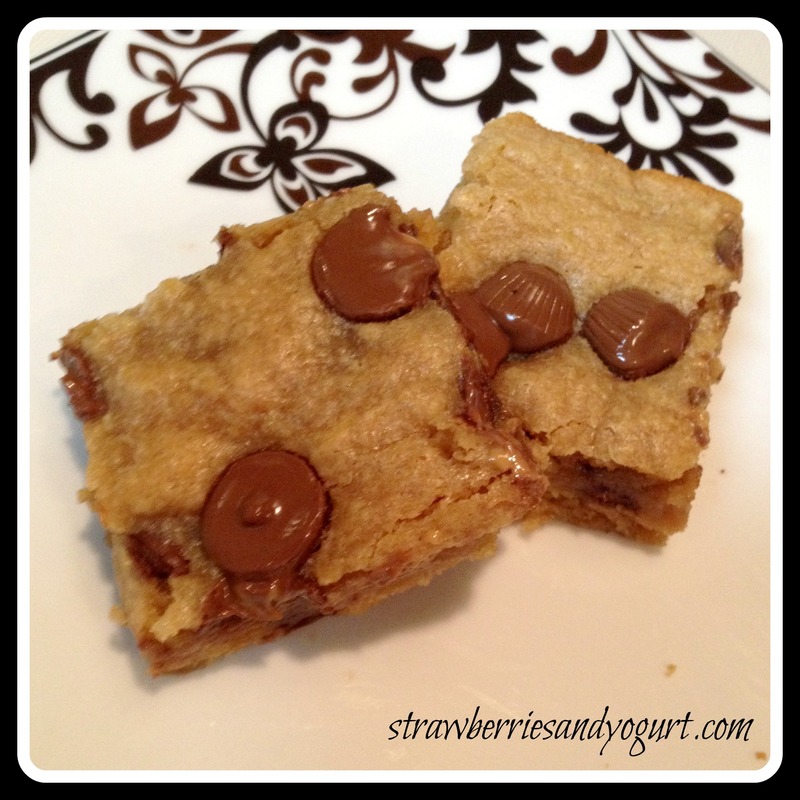 When said chocolate and peanut butter are wrapped in a chewy blondie! We always have mini PB cups on hand in the freezer, so this was the perfect treat on a very cold evening. I use this Macaroni Monday feature purely to give into my first love of Mac n Cheese. The problem is each new recipe becomes my favorite. This recipe is from Mac & Cheese – 80 Classic & Creative versions of the Ultimate Comfort Food. Preheat the oven to 375 degrees. 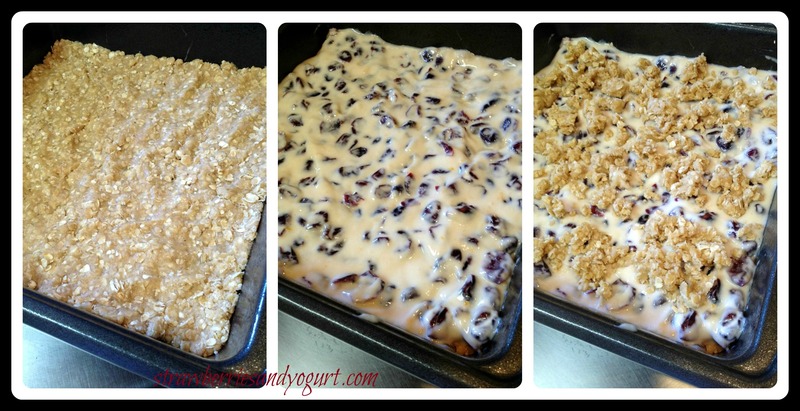 Grease a 13×9 baking pan. (I used a 9-inch baking dish.) Have a bowl of ice water handy. Place the stock in a saucepan and bring to a boil over high heat. Boil the stock until it is reduced by half. Set aside. Bring a pot of salted water to a boil over high heat. 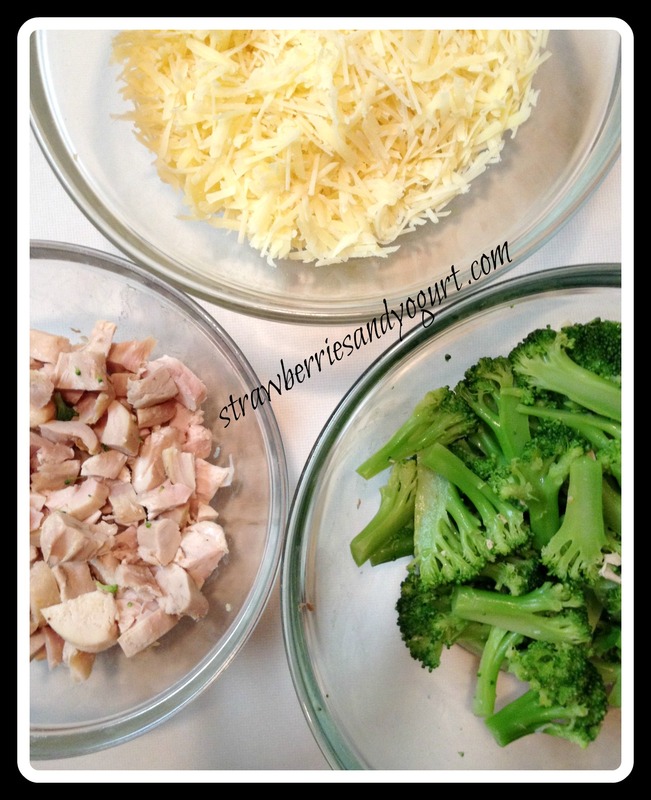 Add the broccoli and cook for 3 to 4 minutes, or until crisp-tender. Remove the broccoli from the pot with a strainer and plunge it into the ice water to stop the cooking action. Bring the water back to a boil. Cook the pasta until it is just beginning to soften to the al dente stage. Drain the pasta, run it under cold water, and return it to the pot. Drain the broccoli, and add it to the pot with the pasta. Heat the butter in a saucepan over med-low heat. Stir in the flour and cook, stirring constantly, for 1 minute, or until the mixture turns slightly beige, is bubbly and appears to have grown in volume. Increase the heat to medium, and slowly whisk in the reduced stock, warm half-and-half and cream. Bring to a boil, whisking frequently. Reduce the heat to low, stir in the tarragon and nutmeg, and simmer the sauce for 2 minutes. Reserve 1/2 c of the Emmental. Add the remaining cheese to the sauce by 1/2 cup measures, stirring until the cheese melts before making another addition. Pour the sauce over the pasta, add the chicken and stir well. Season to taste with salt and pepper, and transfer the pasta to the prepared pan. Mix the reserved Emmental and breadcrumbs together, and sprinkle it over the top of the dish. 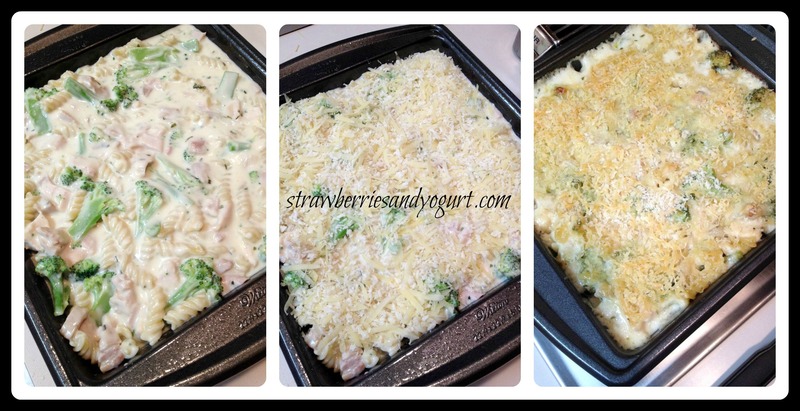 Bake the casserole for 20 to 30 minutes, or until the cheese sauce is bubble and the crumbs on top are a deep brown. Allow to sit for 5 minutes, then serve. 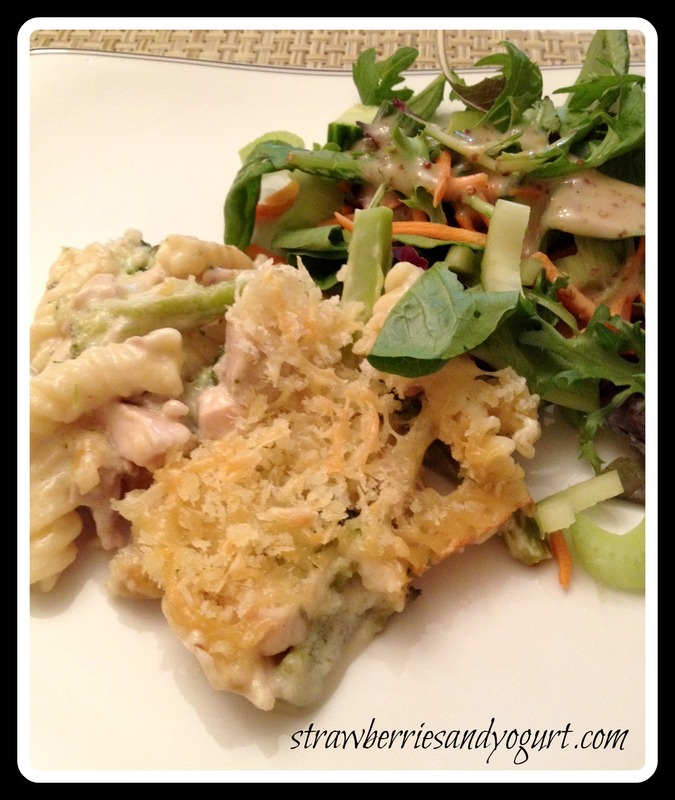 Mac n Cheese with protein AND veggies? It’s so good. I served it with some salad on the side, just to add a little crunch. I’d never heard of or had Emmental cheese before, its a light Swiss cheese. Thankfully, Trader Joes carries all the cheeses I haven’t heard of and might need.